T-Mobile US has announced that it will offer the iPad Air and iPad mini starting at $0 down with 200MB of 4G LTE data each month for life. T-Mobile will offer iPad Air and iPad mini, both with Wi-Fi + Cellular, starting Nov. 1 and iPad mini with Retina display with Wi-Fi + Cellular later in November. When T-Mobile's iPad line-up hits online and participating retail stores, the company will offer the revolutionary tablets starting at $0 down for qualified customers. And every T-Mobile iPad user will receive 200 MB of free 4G LTE data every month for as long as they own their iPad, even if they aren't yet a T-Mobile customer. "When you buy a product as amazing as iPad, you should be able to connect when and where you want, simply and affordably," said John Legere, president and CEO of T-Mobile. "By offering free data for life with incredible upfront pricing, T-Mobile is un-leashing customers to fully enjoy iPad as it was meant to be enjoyed - mobile and connected." T-Mobile offers daily, weekly and monthly options for adding 4G LTE data. For T-Mobile voice customers, 'always-on' iPad plans start at just $10 a month for unlimited data including 500 MB of 4G LTE data each month. Customers can add even more 4G LTE data in 2 GB increments for just $10 more per month. For customers who would rather have the flexibility of on-demand data, T-Mobile offers daily and weekly passes. Daily passes include unlimited data with 500 MB of 4G LTE data starting at just $5. The weekly passes include unlimited data with 1 GB of 4G LTE data for $10. No caps. No overages. Just simple value. Less than two weeks ago, T-Mobile expanded their home data coverage for Simple Choice customers to include more than 100 countries, at no extra charge. Postpaid customers who add a monthly Simple Choice iPad plan automatically get unlimited data in more than 100 Simple Global countries worldwide, at no extra charge. 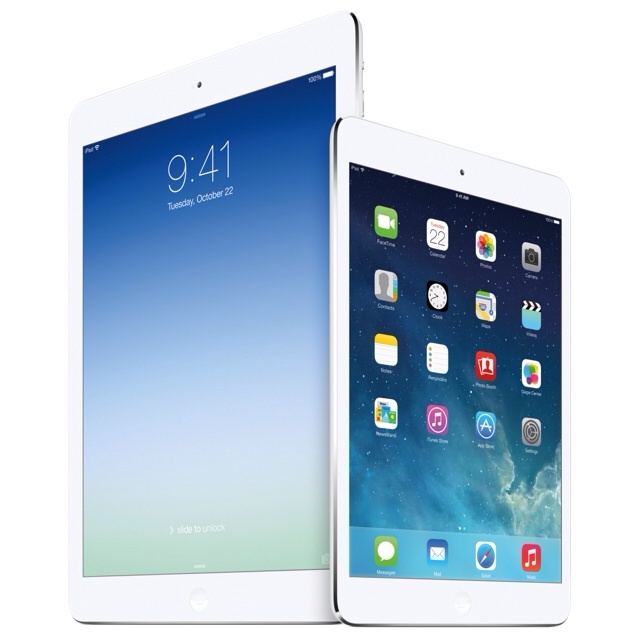 T-Mobile will offer iPad Air starting at an introductory price of $0 down with 24 equal monthly payments of $26.25* for the 16 GB model; iPad mini with Retina display starting at an introductory price of $0 down with 24 equal monthly payments of $22.08* for the 16 GB model; and iPad mini starting at an introductory price of $0 down with 24 equal monthly payments of $17.91* for the 16 GB model (plus taxes & fees). T-Mobile will also offer a program enabling customers to make their new iPad even more affordable by applying the trade-in value of an eligible tablet, even if that old tablet is Wi-Fi only. T-Mobile will offer iPad Air at an introductory price of $99.99 down for the 32 GB model and $199.99 down for the 64 GB model, each with equal monthly payments of $26.25*. iPad mini with Retina display will be available at an introductory price of $99.99 down for the 32 GB model and $199.99 down for the 64 GB model, each with equal monthly payments of $22.08*. iPad Air and iPad mini will be available on Nov. 1, and iPad mini with Retina display will be available later in November.